The IoT revolution also depends on the spread of LPWAN (Low Power Wide Area Network), a low power, long range, and low bandwidth networking solution that’s ideal for smart cities. 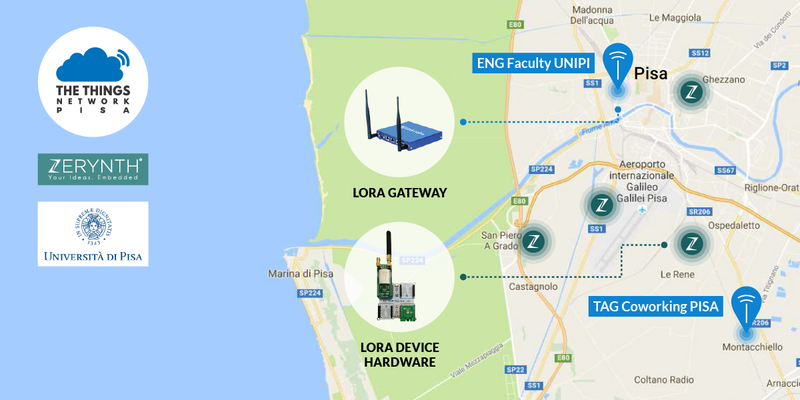 Another important town is now covered with LPWAN, thanks to the efforts of University of Pisa and Zerynth. In fact, during the “Internet Festival” 2016, a panel of experts discussed the current situation of IoT and kicked-off the LPWAN network of Pisa, with the goal to help the local hi-tech enterprises, research centers, makers and enthusiasts addressing the needs of long-range and low-power connectivity. At @Internetfest the kick-off of the Pisa #LPWAN, by @Zerynth, @Unipisa & @thethingsntwrk. The network is based on hardware made by our partners Mikroelektronika and Microchip (Zerynth is an official Microchip Third-Party Development Tool!). In particular, the “LoRa Click” carries Microchip’s RN2483 fully certified LoRa Sub-GHz, 433/868 MHz European R&TTE Directive Assessed Radio Modem. The network infrastructure is provided by TTN (The Things Network), a global community of people over 84 countries building a global Internet of Things data network. Join us in unleashing the Internet of Things and make Pisa part of the global network. Do you want to create your own LPWAN network? Find out how to do it with Zerynth! Download Zerynth Studio today, and find out why everyone is talking about it. It’s free, easy to use, and elegantly designed. Start your IoT adventure with the best tools.